I've heard people say that they liked Lady Gaga better when she was called David Bowie. I was getting ready to pounce all over that statement in this review, but then I discovered that they have a point. Even though The Fame more closely resembles Britney Spears than David Bowie, there are a few moments that are so reminiscent of Bowie that I'm now assuming they were meant to be homages. The title song in particular is instrumented similarly to “Fashion” with tight guitars and a post-disco drum machine. However, the call-and-response style repetition of the word “fame” in the chorus is strongly reminiscent of another Bowie classic (three guesses to which one!). There is another song that sounds like something out of Ziggy Stardust, a song called “Brown Eyes,” that is instrumented predominantly with a sullen piano and some distinctly Mick-Ronson-inspired electric guitar licks. Except, unfortunately, the electric guitar is muted and woefully clean-cut, which is essentially a mortal sin if you're going to write a guitar passage that reminds me of Ronson. I can't think of a good reason for her to have muted that guitar like that; I mean, most lead guitarists consider that instrument an extension of their penises, and that's why they want to make them sound as thrusty and manly as possible. And we all know how much Lady Gaga like penises. Or rather disco sticks, as she calls them in “LoveGame.” I don't usually spend a lot of time laboring over lyrics, but I did spend a good chunk of time this morning trying to figure out if a “disco stick” was supposed to be some sort of double entendre. However, from what I've seen of John Travolta, disco dancers didn't carry sticks around with them, so there's no double entendre to speak of. Even without those dumb lyrics, I don't have much of a fondness for that song. I find the synthesizer groove to be completely dull, and the vocal melody to be flat and uninteresting. It's all a lot of over-produced show. That is a complaint I seem to have about most pop songs these days. 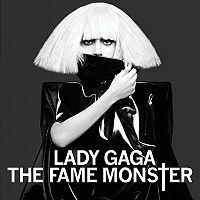 However, surprisingly, that song is more of an exception than the rule, because the songwriting throughout The Fame is quite strong. The hooks surely could have been stronger as a whole, but I found myself mildly enjoying the experience of listening to this album. However, I don't feel that there is truly a definitive hit single here for the ages on par with “Billie Jean,” “Girls Just Want to Have Fun,” or even “Like a Virgin," and I think that's one of its main weaknesses. “Poker Face” makes up for a lot of where “LoveGame” fell short; the menacing drum beat and robotic synth groove gives my toe the predilection to tap, and Gaga's theatrical vocal performance is stylish and attitude ridden. I also like those sci-fi sound effect embellishments that the producers woven into the song, which are fun and keep the song extra punchy. With that said, the production as a whole is a mixed bag. For every “Poker Face,” there are two songs like “I Like it Rough.” While “I Like it Rough” has a decent vocal hook, and a classy synthesizer that buzzes around deeply, it's basically the same old groove being repeated over and over from beginning to end. And the end is a fade-out! I do at least appreciate that the producers by and large picked drum machines that have a crunchy sound instead of a tinny sound, and the synthesizers are much more reminiscent of early Gary Numan than Madonna's vomit-inducing American Life. But there's very little about the instrumentation that excites me. However, there is only one spot in this album where I felt that they epically screwed things up. It was in “Starstruck” when they inexplicably decided to embellish Gaga's vocals heavily with an autotuner. What's more, that drum beat is so stone-cold and boring that I get tired of listening to it after just a few seconds. I think it should kill itself. Other than that, these songs aren't all that bad. Read the track reviews for more juicy detail! I've heard some people have say it was presumptuous of her to write about things like the paparazzi and fame on her debut album, which of course was written and recorded before she even had the chance to become famous. However, these songs are about the fantasy of achieving fame and glamor, which of course is going to strike a chord with a lot of little girls out there. What's more, I reckon that Her Royal Majesty Gaga Herself was fantasizing quite deeply about fame and fortune herself as she cut this record, and as every well-advised creative person knows, write about what you know. Well, she did, and look at where that got her. Really, I'm quite jealous of her; she gets to wear the most bizarre costumes out in public imaginable and, yet, she's not destined for the loony bin. I go to the grocery store in a worn T-shirt and middle-aged women left and right are giving me the stink-eye. 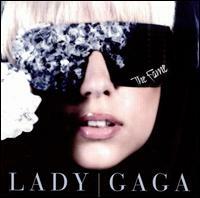 These eight songs were originally intended to be bonus tracks on an impending reissue of The Fame, but Her Lady Gaganess issued a royal decree for this short album to be released separately and be dubbed The Fame Monster. I say good for her and good for the world; nobody who bought The Fame needed to buy it again just to obtain the bonus tracks. People these days have a hard enough time buying food much less buying another copy of a Lady Gaga album that they're probably already tired of. It seems that the general consensus among critics is that this marks a slight overall improvement in Gaga's sound and songwriting. However, I can only agree with that in the sense that there isn't a song even remotely as dismal as “Starstruck” from the previous album. As a whole, this is an even extension of her mega-selling debut album; you'll like this about as equally as you liked that. (I'm guessing that the critics were slightly warmer to this follow-up because they've grown more used to her. You know how much of a fickle lot they are.) Lady Gaga continues to write or co-write all of her songs, and some of them are quite good. Others not so much. But a pop album only needs a winner or two to be considered successful, doesn't it? By and large, the best song is the opener, “Bad Romance,” which catches me right at the beginning with a soaring and memorable vocal melody. My attention is thankfully never released as the song goes on, as she starts a playful, quasi-rap. The lyrics are total nonsense, of course, but that's just being faithful to the lyrical style of The Fame (and I don't the purposefully inane lyrics enough to do a battle with them). I'd say the song is overproduced, but it's slick and the beat is crunchy enough that I wouldn't be so heartless as to classify it as 'electrogarbage,' even though I might be tempted to. It's not a song I would want to listen to more than two or three times in my life (too late! ), but I find it agreeable enough. It's your best bet if you just want to listen to one song to gauge whether you're cut out to be a Lady Gaga fan. “Alejandro” has often been compared to ABBA, and I suppose that's fair if you're just talking about the instrumentation. There is a definite clean and slick euro-pop feeling to it. Gaga overdubs herself in a way reminiscent of Agnetha's and Anna-Frid's tight vocal harmonies. Other than that, it's nothing like an ABBA song! Even in the worst of ABBA's songs in their slick, Europop days, they would be loaded with at least 10,000 hooks. All “Alejandro” basically does is repeat the same basic line of melody over and over again. But at least it's a good line. Somehow, the song production gets worse as the album progresses. That, coupled with the fact that there are only so many songs with loud disco beats that I can take in one sitting, makes The Fame Monster grow rather tiresome by the end of it. Instead of being fresh and vibrant, “Dance in the Dark” and “So Happy I Could Die” sounds thick and dreary. C'mon, Miss Gaga Lady, disco beats don't automatically make your songs fresh and fun! “Telephone” presents a bit of a poser. Listening to it here, I might not have considered it good song. However, before writing this review, I've grown rather fond of a country-rock version of it by The Morning Pages, which makes it seem like the catchiest and most enjoyable song that I could possibly have conceived of. Here, the song seems a bit too frilly, and it's over-reliant on those voice effects particularly in the middle when Beyonce takes over the vocals. But there, I want to do nothing but bounce my head agreeably with it! So there it is; modern day country-rock beats modern day pop-rock. It's unquestionable in my mind that Lady Gaga is a talented singer and songwriter. Her songs might not have the hooks or staying power of a typical Elton John or Queen song, but a few of them come awfully close to it. Unfortunately, the production is consistently overcooked throughout this album—much like The Fame—and frequently that only served to compromise what otherwise could have been an excellent tune. Perhaps, in the future, Gaga will take more creative control over the production, and she would craft them more carefully so that they would be given more room to blossom. But I won't be holding my breath.